The story begins when Hana, Saaya, and Homare from Hugtto! PreCure take Hagutan out for her flower garden debut. All of a sudden, the monster Usobaakka appears. He attempts to change the world into the one filled with lies and kidnaps Saaya and Homare. Hana learns the girls of Maho Girls PreCure! and Kirakira PreCure a la Mode are also his targets and decides to support them. During the battle, Hana remembers one unfulfilled promise from Usobaakka's word "Promises are lies that can't be kept by anyone." It was Hana's very important promise with a boy named Clover, whom she met in a strange world in her childhood. She gradually realizes the promise is the beginning of this big trouble. 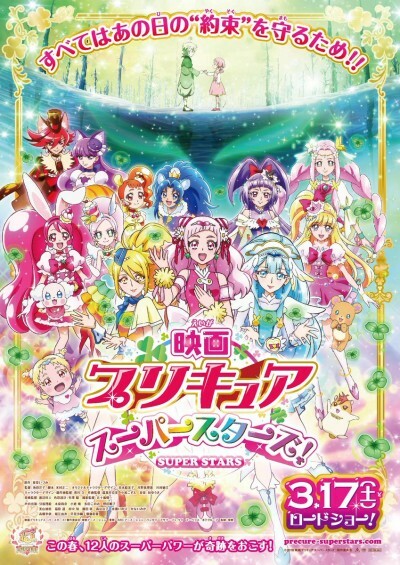 In cooperation with the PreCure girls in three generations, will Hana be able to beat the strongest enemy Usobaakka and fulfill the promise with Clover?